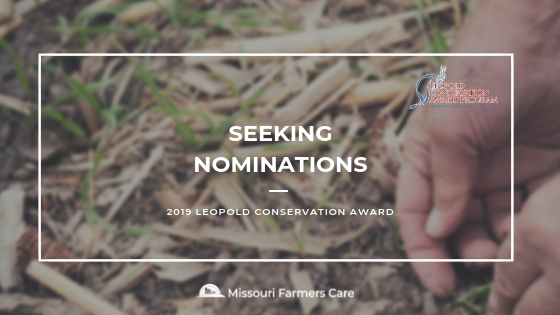 The Leopold Conservation Award recognizes extraordinary achievement in voluntary conservation, inspires other landowners through their example, and helps the general public understand the vital role private landowners can and do play in conservation success. 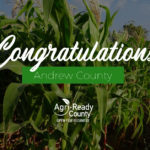 In Missouri, the award recipient receives an Aldo Leopold crystal and $10,000. "Conservation can accomplish its objectives only when it springs from an impelling conviction on the private land owners." 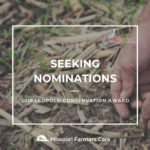 Download the Missouri Leopold Conservation Award call for applications to view the award criteria. View examples of Missouri Leopold Conservation Award applications. Applications can be submitted online, by email, or by mail to 4481 Brown Station Road, Columbia, Mo. 65202. Know a Missouri landowner who is committed to land management practices that increase conservation? 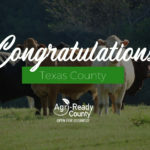 Nominate yourself or another landowner. 2018 - Scherder Farms; Frankford, Mo. John and Sandy Scherder, along with their daughter and son-in-law, Holly and Curtis Delgman, were named the 2018 Leopold Conservation Award recipients. 2017 - Uptown Farms; Laclede, Mo.